Yesterday I had what was quite possibly the most terrifying dream of my adult life. I was working in a warehouse at the top of an unfinished skyscraper. I had no safety equipment and I spent every second of every day in mortal terror of falling to my death. I found myself so paralyzed with fear that I got very little actual work done. My bosses kept offering me drugs to calm me. I got to the point where I was desperately clinging to a beam for dear life and refusing to let go. Finally, after all my efforts to prevent it, I fell anyway. And now for my absolutely unqualified analysis of the dream. For some time now I have been considering some drastic steps to jumpstart my career and leave my days of working for someone else behind me. The problem is, some of the things I have in mind are very risky and liable to cost me dearly if they don’t work out. It’s a frightening thing to think of living life without the safety net of a steady paycheck. At the same time, I’m afraid if I don’t do something soon it may be too late. In short, the dream was my brain’s not so subtle way of telling me to take the leap. I’ll be just fine. Chances are, one of these days I’ll find myself without that safety net anyway and have nothing to show for it. 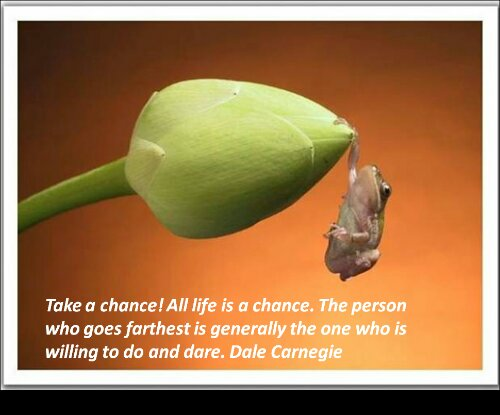 It’s time to start taking chances.